When you need an APU, contact us. Our complete line of design, engineering, test, analysis, manufacturing, and installation services will provide you with the very best solution. The example project below shows some of the details of a typical Aerocon APU solution. Aerocon provides a simplified design for an upgraded APU for C-130's equipped with modernized avionics packages. The new design is easier to maintain and operate, and has a much higher mean time between failures (MTBF) than the existing APU. Aerocon's system for a C-130 AMP upgrade. 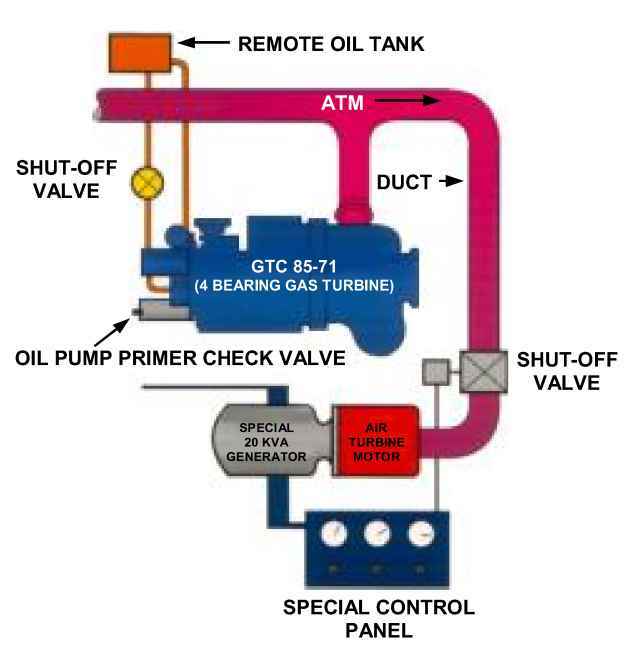 Aerocon's system removes concerns about replacement parts for GTC/ATM. It enhances aircraft operational capability by providing increased capacity for supplemental flight deck and rackmount electronics, avionics, and air conditioning equipment. 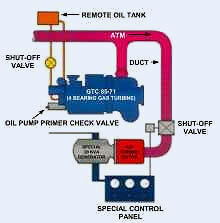 Additionally, it increases the amount of bleed air available for safe main engine startup. 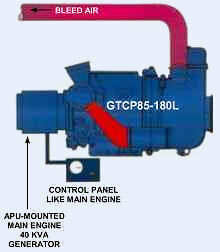 It shares parts commonality with the C-130H model APU engine and generator, thus decreasing required spare parts inventory. This allows the unit to be more extensively overhauled, minimizing replacement costs. Additionally, its increased MTBF relative to older units increases the time between maintenance intervals, ultimately lowering operator costs. The upgrade pays for itself after approximately three years of service. Installing the upgraded system is simple. No major structural modifications are necessary, resulting in minimal aircraft down-time. Additionally, Aerocon is always willing to provide installation or technical assistance as required by the operator.